Lueszler lived and studied in Japan for ten years. She explored numerous Asian art forms and is an expert in sumi-e (ink painting). Leuszler has a flair for black and white painting and a wonderful sense of design as exemplified in her use of positive and negative space. In some of her paintings the artist introduces color in her landscapes by grinding pigment from the rock at the site. Now with a studio in her native Colorado one can see the blend of the far east meeting the American west in her paintings. 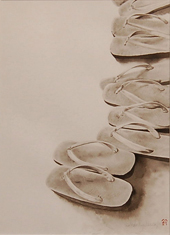 The John Deaux art gallery features her sumi-e from the more traditional to the contemporary. Her award winning paintings have been exhibited in the Tokyo Metropolitan Museum of Art.